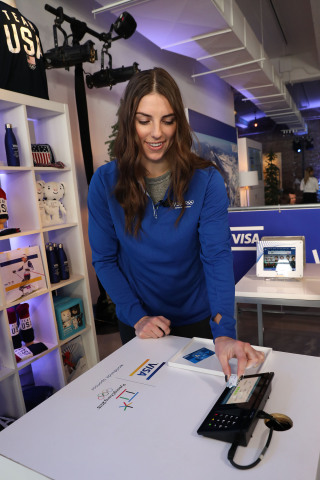 From the slopes to the online shopping cart, Visa creates a seamless experience for fans to support their favorite Olympian! SAN FRANCISCO--(BUSINESS WIRE)--Dec. 7, 2017-- Visa (NYSE: V), the official payment technology partner of the Olympic and Paralympic Games, is making it possible for you to dress like your favorite Team USA athlete. Fans at home watching the Olympic and Paralympic Winter Games PyeongChang 2018 will be able to buy Team USA apparel with just a few clicks using Visa Checkout. For the first time during the Olympic Winter Games, NBC will direct viewers to a newly launched platform where they can browse and buy gear from the Team USA Shop worn by athletes from the mountain to the medal podium. As a leader in payment innovation, Visa continues to showcase the future of digital payments and bring the excitement of the Games closer to fans all over the globe. This new platform is an extension of Visa’s Olympic Winter Games commerce experience, including the recently announced wearable payment devices, such as payment-enabled gloves, commemorative stickers and Olympic Winter Games pins, all commercially available in South Korea. The wearables allow fans and athletes to complete seamless and secure payments with a simple tap at any contactless-enabled terminal. In an effort to make the online checkout process faster and simpler for fans, Visa is the preferred payment method on the shopping platform, and fans can spend more time catching medal-worthy moments by paying with Visa Checkout. As home to the Olympic Winter Games, NBC will integrate the platform into on-air prompts and digital channels, directing fans to a new shopping experience that features similar products to what they are seeing on athletes. The featured gear from the Team USA Shop, powered by Fanatics, the global leader in licensed sports merchandise and official ecommerce partner of Team USA, will include sweatshirts, beanies, mittens, t-shirts, hats and more, and purchases will support the Team USA athletes. While the platform is now live with apparel available for purchase, the Opening Ceremony will mark the first time the shopping platform will update in real-time, and continue throughout the Games. Team Visa athletes, including Americans Mikaela Shiffrin, Chloe Kim, Gus Kenworthy and Hilary Knight, will be featured on the platform when they are competing or appearing. Click here to find the current roster of Team Visa PyeongChang 2018 athletes.